Install Promox 4.4 on all 4 nodes. Configure users, groups and ACLs appropriate for Vagrant. Create a base CentOS 7 template to work with Vagrant. Install the vagrant-proxmox plugin and provision a CentOS VM. Demonstrate a Vagrantfile debugging technique when using the vagrant-proxmox plugin. This was critical in solving my problem of getting the plugin to work with Proxmox 4.4 and Linux Containers (LXC). 1. Begin by downloading the Proxmox 4.4 ISO. 2. Create a bootable USB disk. If you are running OS X, start by opening a terminal. 3. Convert the Proxmox ISO to an Apple disk image (*.dmg). 5. Ensure that you have CPU virtualization (i.e. Intel VT-x support) enabled. 6. Remove the USB disk and install Promox on all the nodes. The installation is straight forward; simply, follow the installation screens. Given that we are configuring a cluster of Proxmox nodes, it is critical that each node has working forward and reverse DNS records. While configuring DNS is out of the scope of this post, I personally run pfSense as my router solution with DNS forwarding enabled. (See my article on my home network set up using pfSense if you're interested.) The DNS forwarding service allows you to statically define ad-hoc DNS entries similar to a local /etc/hosts file without the need for running a full blown DNS service like BIND. pfSense DNS entries for Promox using DNS Forwarding. I decided to call my cluster glab (Gaston's Lab). Then, I logged into my first node and created the cluster. After creating the cluster, I logged into nodes 2, 3, and 4 and added them to the cluster. The pvecm add command takes the the first node's IP address or hostname. It will prompt you for the root password on the first node so that it can copy the SSH public key to the other nodes. Check the status of the cluster by running: pvecmd status. This can be run on any node. Lastly, ensure that your network is configured correctly for multicast. By default my Netgear GS 108T Switch had multicast disabled by default. I had to enable a few settings in the Netgear management interface. Consult your respective switch documentation. For additional information on the network requirements for Promox clustering refer to Multicast notes. Now, we can log into any of the nodes via the Web UI (https://<proxmox node>:8006) and view our cluster. Finally, it looks like my original dilemma is almost solved! I have a total of 32 cores and ~48 GB of RAM at my disposal for running my VMs remotely. If I ever hit the resource limits on this machine, I can always purchase more RAM for each node and more disk capacity. Heck, I can even purchase another Dell C6100 with four more nodes. 1. Begin by logging into the first node via SSH. 2. Update the list of available Linux Containers (LCX). 3. Search for a container image. I am a fan of CentOS 7 given that it's the closest Linux distribution that models typical server deployments. 3. Download the container image to your local storage. 4. Ideally, you should use shared storage in a cluster; however, I do not have the infrastructure at home for network attached storage (yet). As such, I repeated steps 1 - 3 on the other nodes. Navigate to Storage View > node > local (node) > Content to confirm that the container image has been added. Optionally, create a Vagrant user so that the vagrant-plugin can manage VMs without using root's credentials in your Vagrantfile. Promox supports multiple authentication realms—namely, PAM for logging in using Linux system accounts and Proxmox VE Authentication Server. We will use the latter. Note: It is only necessary to run the commands below on a singe node. The account will propagate to the other nodes in the cluster. 1. Log into the fist Proxmox server as root via SSH or the console. 2. Create a vagrant group. root@pve-n1:~# pveum groupadd vagrant  -comment "Vagrant group"
3. Allow the vagrant group to manage the root as a Proxmox administrator. 4. Create a vagrant user and assign it to the vagrant group. The container image (or template) that we installed earlier should be customized to work nicely with Vagrant. Additionally, it is an opportunity to add a few customizations to the base CentOS 7 image based on your needs. 1. Log into the Proxmox web GUI and create a new container. Once logged in, click the Create CT button. Since we created a dedicated user called vagrant in the last section with admin privileges, we can use that user to login. Ensure that you select Proxmox VE Authentication Server as the authentication type. 2. For the base container, I used the following settings. However, you will need to adjust the values based on your environment. 2. From the Web UI, select the Server View from the drop down menu, navigate to the node where you created the container and start it. 3. From the Web UI, click the Console button and log in. 4. Update CentOS 7 to ensure that you have the latest patches. 5. Install basic networking utilities (ifconfig), rsync, sudo and sshd. You can add other packages based on your base CentOS 7 needs. 6. Start the SSH daemon and configure to start on start up. 7. Create a vagrant user. 9. Create an SSH key pair on your local workstation. Most Vagrant boxes use the SSH private/public key pair from https://github.com/mitchellh/vagrant/tree/master/keys. This key pair is insecure as everyone in the world has access to the private key. As such, we will generate a new SSH key pair on our local workstation. $ ssh-keygen -t rsa -C "Vagrant SSH key" -f ~/vagrant-keys/vagrant -N ""
10. From your local workstation, run the following to set up the SSH public key on the container. 11. From your workstation, test your key and ensure that you can log in without a password. Then, test switching to root without a password. 12. While still logged in as root, clean up the disk space and the Bash history. 13. Log into the Proxmox Web UI and shutdown the container and then remove the network interface from the Network tab. 14. Log into the Proxmox server via SSH as root and use vzdump to create a backup of the new container. Note: For some reason you can no longer create GZIPed tarballs (*.tar.gz) using vzdump. 15. I could not find a clear guide on how to create an LXC template from an existing container. (Seems simple, right? Wrong!) So, I attempted a model similar to the method used for OpenVZ containers. Basically, take the container backup from the previous step, LZO uncompress and unpack the tar file into a temporary directory. Then, create a new compressed tarball using xz (tar with the -J option) and write it to the template directory. root@pve-n1:/var/lib/vz/dump/tmp# tar -cpJf /var/lib/vz/template/cache/centos-7-base_20161225_amd64.tar.xz . 16. 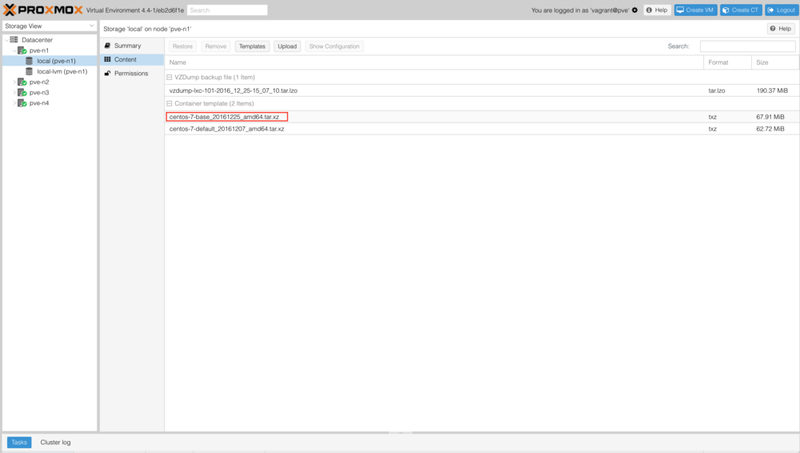 Confirm that you can see your new template under Storage View > node > local > Content in the Proxmox Web UI. 17. While Proxmox 4.4 uses *.tar.xz files for templates, the Web UI does not let you upload them. It only allows you to upload *.zip and *tar.gz. To work around this, scp our new template to the other nodes. They should be copied to the /var/lib/vz/template/cache directory. Once their, they will appear in the web UI. Before we can provision a container using Vagrant, we need to install a Vagrant plugin provider for Proxmox. At the time of this writing, I had many issues with the vagrant-plugin. I experienced issues on both Proxmox 4.4 and 3.4. After many debugging sessions I was able to patch the plugin using a couple of pull requests (for 4.x: pull request #26 and #32; for 3.4.x, they were my own). As such, the instructions below, detail the builds steps for my fork of the plugin. These steps assume you are on a Mac. Getting Vagrant to work nicely under Windows is a pain due to long standing issues with the brittle rsync support, so setting up the plugin under Windows is outside the scope of this post. Upgrade Ruby to the latest 2.x version. Open a new terminal and ensure that Ruby has been updated to the latest version. Clone this project and build the plugin. Uninstall the vagrant-proxmox plugin if exists and install the plugin locally. Add the dummy Vagrant box for this provider. config.ssh.private_key_path - Set this to the private key path that we created earlier in this article. config.vm.hostname - Set this to the hostname that you would like for your container / VM. proxmox.endpoint - Replace the IP with any one of the nodes in your cluster. proxmox.user_name - We created a vagrant user in this article using the PVE Realm. So, no changes are required here if you followed these same steps. If you want to use root (not recommended), use root@pam. proxmox.password - Replace with the password that you set when you created the vagrant user account. proxmox.openvz_os_template - If you followed the instructions to build a custom template using the instructions in this article, you should not need to change this file name. Also note, in a cluster, you need to ensure that this template is available on every node under: /var/lib/vz/template/cache. proxmox.vm_storage - All LXC containers must be deployed to an LVM store. local-lvm is the default, so you should not need to change this value. box.vm.network - Set the networking settings based on your network. Then, log in and enjoy your new container! At this point, we have a fully open-source solution for provisioning containers using Vagrant on our own private virtualization infrastructure. While it was a bit of work to set up everything, it should now be a "frictionless" tool to allow us to do our jobs effectively. Any time we need a new VM, it should be a simple matter of defining a Vagrantfile and running vagrant up. In the next post, we will focus on creating a provisioning script to provision SolrCloud using Vagrant. Until next time! Unable to create the virtual machine! Clearly, we can see that the POST request to /api2/json/nodes/pve-n1/lxc is failing, but why? Given that all requests to the Proxmox API take place over HTTPS, we can't simply watch the packets using a network sniffer to inspect the request and response. After a bit of thought, my solution was simple: Create a local HTTP tunnel to the Proxmox server using stunnel. With this approach we can have stunnel listen on a local port using HTTP and tunnel the traffic over TLS to Proxmox, thereby allowing us to sniff the packets. As always, these instructions require a Mac. 1. Install stunnel on your Mac. 2. Create a minimal stunnel configuration file (/usr/local/etc/stunnel/stunnel.conf). Change the output log path and the connect settings. The value for connect should be your Proxmox server. 4. Download and install Wireshark. 5. Start Wireshark and capture packets on the loopback interface. 6. Set the Wireshark filter to: http and tcp.port == 8006. 7. Update your Vagrantfile to refer to your local machine over HTTP as the Proxmox endpoint. 8. Run vagrant up and watch the API HTTP POST requests to Proxmox and the response. As an example, I updated my Vagrantfile and incorrectly defined the proxmox.openvz_os_template to refer to a nonexistent template. When we look at Wireshark, we can clearly see the HTTP 500 response and error message indicating that the volume does not exist. For those of you still following along, we have come a long way in setting up the foundation for a personal virtualization platform. We finished the last post, Building a Developer Virtualization Lab - Part 2, by configuring Vagrant to provision a single container in our Proxmox cluster. Having done that, we now have set the stage for actually using our infrastructure to host multiple containers. I concluded the last post by saying that this article would be around deploying a multi-node SolrCloud cluster. Well, this is not exactly true. Instead, we will lay the foundation by installing a multi-node ZooKeeper ensemble. We might as well deploy everything following an architecture that resembles a production deployment. My other motivation for starting with ZooKeeper first is that I also intend to run Hadoop and HBase on this infrastructure and HBase also has a dependency on ZooKeeper. Proxmox will continue to be our target deployment virtualization environment. Chef, specifically, Chef Zero, will be used as the provisioner for Vagrant. Our Vagrantfile will be updated to support multiple machines using the multi-machine support in Vagrant. Roughly one year ago I deployed my dream home network and thought it would be interesting to expand the network to include a virtualization lab for personal as well as work use. In my consulting capacity, I typically have anywhere between 2 and 4 VMs running on my MacBook Pro using VirtualBox. Even with 16 GB of RAM and a 3.1 GHz i7, my system is typically at capacity. Even with this model, I typically have to stop some VMs so that I can start a different set depending on my active project. My goal was to free up the system resources on my local machine and shift from running VMs locally to a remote environment. While AWS is great for work (as I do not pick up the bill), it is extremely expensive for personal use. Naturally, this left me to find a low cost hardware solution and run my own virtualization stack.